But then I came home-home. And this home is wonderful too. Because it includes my person. And my pups. So I made fish tacos with a cast iron. And those were more wonderful than I can explain in two dimensions. Yep. Our roots are vital to stay attached to, but the subsequent shoots and leaves we grow from them can be just as delicious. Roughly dice all ingredients for the salsa. Combine with lime juice. Stir, then side aside to chill and incorporate. Cut tilapia into large bite size chunks. Season fish generously with sea salt, cumin, paprika and Cajun seasoning (I didn’t measure… I just threw some seasoning in there until I liked the color and felt like the spice would be enough without being overpowering). Heat cast iron skillet on grill or stove. Once hot, add enough neutral oil to coat pan thickly. Heat about 3 minutes. Add tilapia to pan (be careful, the hot oil may splatter). Cook until outside is seared and chunks are cooked through. 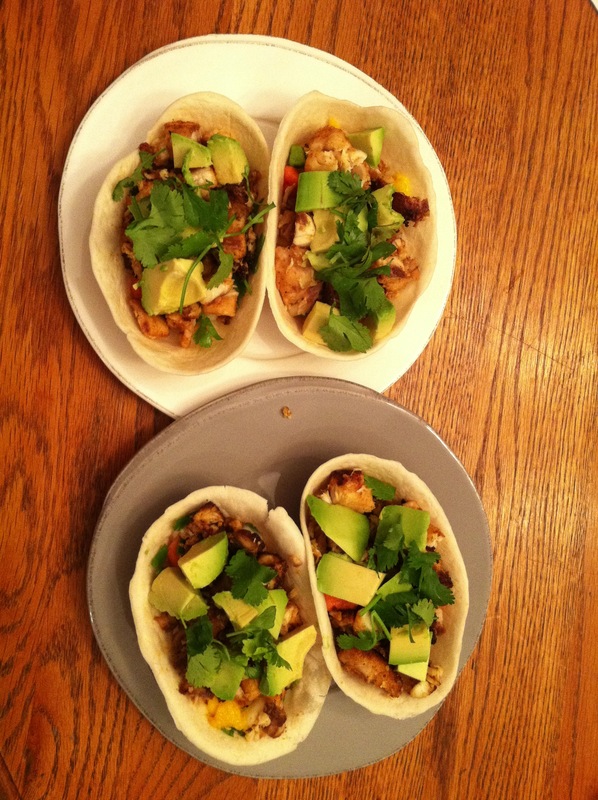 Assemble tacos with shredded cheese, avocado, papaya mango poblano salsa and fish.